These classic plaster casts are a staple in many artists studios. They are proportionally correct drawing aids. They are imported from China and an excellent value for any school or studio. They are not to be confused with high quality, finished and polished plaster casts. Unsanded seams and an occasional air bubble hole are not uncommon. Most of them are hollow and surprisingly lightweight. The play of light and shadow on these casts makes them fascinating objects; whether you are going to use one in a still life, for classroom use, or simply to have in your studio for inspiration! 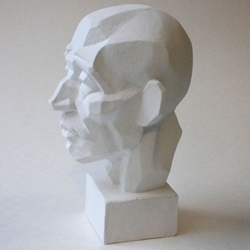 Plaster Casting - David Head Size 7"x 4"